Germany has a reputation for efficiency and it seems it is well earned, with German workers spending the least amount of time in the workplace of all countries in the Organisation for Economic Cooperation and Development (OECD) during 2013. In terms of members of the European Union, the country at the other end of the scale was Greece, whose people worked an additional 700 hours over the course of the year compared to the average German. Of all OECD countries, Mexicans worked the longest hours, closely followed by South Korea. 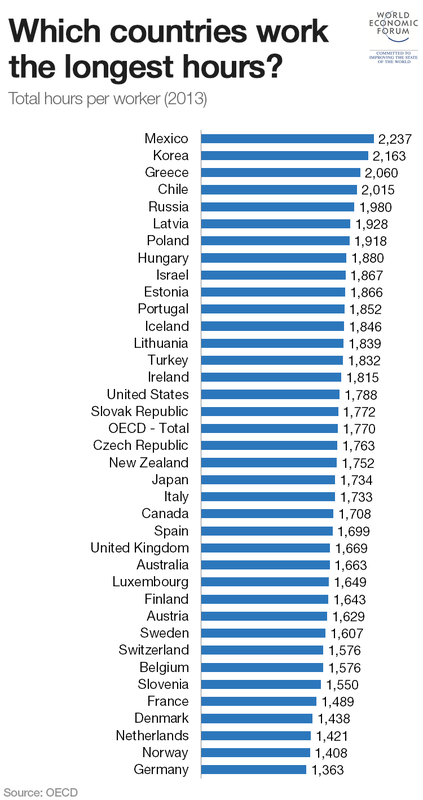 US workers clocked up a similar number of hours to the OECD average – 1,770. But that’s still an extra 425 hours on average compared to their German colleagues – the equivalent of 53 working days. Norwegian, Dutch, Danish and French workers join the Germans at the bottom of the table, all working fewer than 1,500 hours across the year. Image: A welder works on a car to be fitted with armor plating at a garage in Mexico City. REUTERS/Claudia Daut.